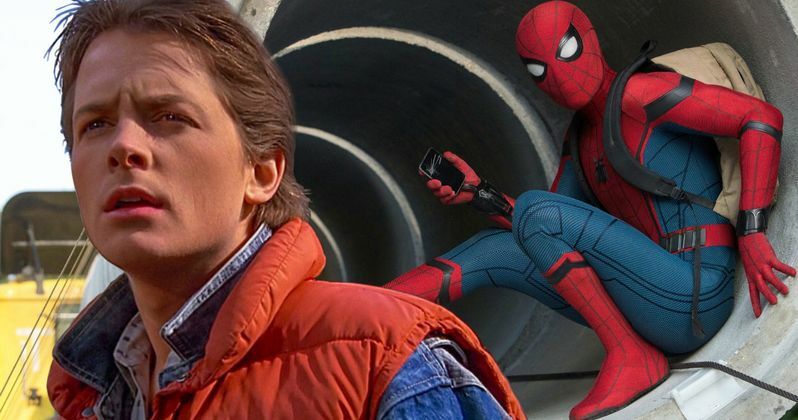 Tom Holland revealed that the main inspiration for Peter Parker in Spider-Man: Homecoming is Back to the Future's Marty McFly. Spider-Man: Homecoming is definitely embracing the work of 80s icon John Hughes (Ferris Bueller's Day Off, Uncle Buck). Hughes was a master of the 80's teen movies, and it seems like an interesting take on the Spider-Man franchise to mix it with decades old teen movies. Spider-Man: Homecoming director Jon Watts gave the young cast homework before production began on the upcoming movie, trying to get them into the same groove. Holland did an interview with Yahoo Movies Facebook and revealed that Watts made the cast watch all kinds of videos and movies from the 1980s to prepare for Spider-Man: Homecoming. Holland explains. "I think that was one of the things that Jon set out to do and its just a reflection on him, as a director, that's he's getting this kind of a response from. He gave us a load of videos, old movies, to watch before starting shooting: Pretty in Pink, Back to the Future, Breakfast Club, Ferris Bueller's Day Off." All of the movies that Holland mentioned were written and directed by John Hughes except for Back to the Future and Pretty in Pink, the later of which he only wrote and executive produced. Holland went on to talk about some personal influence and a goal that he created after watching the homework that Watts assigned him. Read about Holland's lofty goal below. "My goal was to try and kind of be our generation's Marty McFly. That was what my all-time goal was, and I was actually lucky enough that a journalist said, 'Oh, you're kind of like Marty McFly in this movie." We'll have to wait until July 7th, 2017 to see if Holland reaches his goal, but those are some mighty big shoes to fill. That could be enough to get some people into the theater though, and that's all that really matters at this point in the summer blockbuster game. Tom Holland also spoke about how he thinks that the movie can stand alone if stripped from all of the superhero scenes. Holland says this. "One of the best things about this movie is if you stripped away all of the Spider-Man scenes, there's a really solid movie there without the superhero aspect about Peter growing up, going to school, struggling. So it's a nice balance between superhero and kid at high school." That could be seen as a controversial statement as some fans don't really want to see a John Hughes Spider-Man movie that can hold its on without the superhero antics. It does seem like a refreshing take on Spider-Man though, to see him as a high school kid rather than the grown up, boring man-child that Tobey Maguire eventually portrayed in the later Raimi movies. Holland didn't mention what it was like to see his costar Robert Downey Jr. in a few of his homework assignments, but that has to be kind of a trip for Downey. We'll have to wait until July to see if this all pans out for the young Spider-Man, but it does look promising on paper. For now you can watch the Tony Stark and Peter Parker NBA Finals commercials until the release of Spider-Man: Homecoming on July 7th, 2017, of which we have one for you here now.